Originally commissioned by Phillips Auction, December 2017. Peter Voulkos, Rondena, 1958. Stoneware, paddled and constructed wheel-thrown elements, brushed cobalt, iron, and white slips, epoxy. So many things had to fall into place for Rondena to exist that it might be taken as a miracle first, and an artwork second. The first precondition, of course, was Peter Voulkos’s decision to become an artist. This was by no means a foregone conclusion. The son of working class Greek immigrants who lived in Montana, he was only able to attend college thanks to government support through the GI Bill following his service in World War II. Following his studies at Montana State, and subsequently the California College of Arts and Crafts, he emerged as one of America’s most skilled potters. In most respects, he was also a traditional one, a maker of elegant and familiar forms. He had focused on the lidded vessel while at CCAC; one could say he got his master’s degree in tureens. This orientation to the well-made, functional pot would not last long. In a remarkable series of creative leaps, Voulkos first began using his pots as canvases for expressive painting, then began to dismantle the pottery’s vocabulary entirely, and reassemble it at will. 1956 was a year of explosive discovery, with statements like Rocking Pot (Renwick Gallery) and Rasgeado (private collection) establishing a wholly new, constructivist approach. Voulkos drew on many sources to arrive at this avant garde breakthrough, among them the cut-and-assembled pots of Picasso, and prehistoric Japanese ceramics; but the rough energy he brought to the medium was something new. Nor did he pause to consolidate his discoveries. Through the late 1950s and into the next decade, he moved rapidly from one idiom to the next. While teaching his legendary course in ceramics at Otis Art Institute – the proving ground for a generation of Southern California ceramic sculptors – he became close with John Mason, arguably the only ceramic artist who could keep up with him at the time. The two men were perfectly mismatched: a voluble extrovert who inspired a party wherever he went, and a quiet, hard-working Midwesterner. 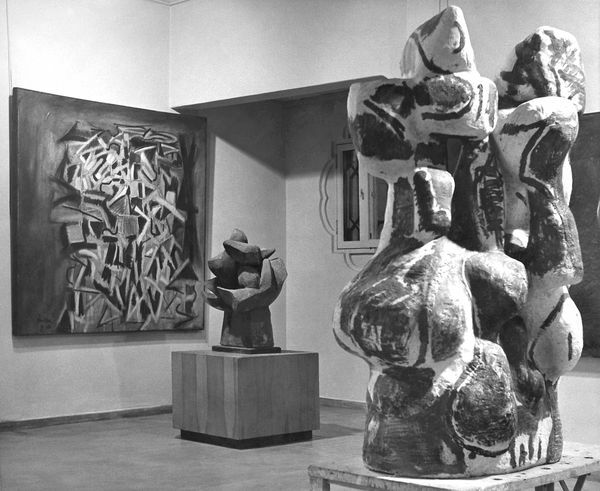 Voulkos’s collaborative relationship with Mason was the second precondition for Rondena. They were a perfect team. Together, they set up a new studio on Glendale Boulevard in 1957, and began outfitting it with innovative features: industrial humidifiers and mixers, taken from fruit warehouses and bakeries respectively; and an enormous walk-in kiln, reputedly the largest outside factory anywhere in the USA. They also had plenty of space to work. Their shared goal was to create large ceramic sculptures, and in this they succeeded wildly – creating the largest monolithic works in fired clay that the world had ever seen. Installation of the exhibition Ceramics, Sculpture and Paintings by Peter H. Voulkos at the Pasadena Art Museum. From left to right: Zapata, Burnt Smog (aka Funiculated Smog), Rondena. © Voulkos Family Trust, Courtesy of the Voulkos & Co. Catalogue Project. Voulkos’s first experiments at Glendale Boulevard seem not to have been successful, for we have little extant work from 1957. The following year was different. A whole series of innovations led to the third crucial precondition for Rondena – the very technical possibility of its making. This was a complex and physically demanding process, using thrown cylinders and slabs as constructive and compositional elements. Voulkos deployed his skill as a thrower to create short pipe-like units that could be incorporated into the piece as he built it, a kind of flexible, intuitive infrastructure. Using this armature, he was able to realize a series of mighty sculptures. The majority of the ones made in 1958 have monochromatic dark surfaces, achieved with an iron-bearing galena slip: 5000 Feet (LACMA), Funiculated Smog (bought by Edgar J. Kaufmann for Fallingwater), Flying Black (private collection), Black Butte Divide (Norton Simon Museum of Art, Pasadena), and Black Bulerias (private collection) –the titles reflecting the aesthetics, as if these massive sculptures were storm clouds brought down to earth. Rondena is different, more puzzle-like in its composition and less ominous. The buff-colored clay, reinforced with particulate “grog” for strength, is the same used in Voulkos’s black sculptures, but it is left partly uncovered. Three different slips – a cobalt blue, a rich iron red, and a white – are painted on to the form. This is an unusual combination in Voulkos’s oeuvre, though it does have one close correlate in the smaller work Vee (also 1958, now in the Fine Art Museums of San Francisco). When he did use polychrome in this period, he typically preferred black, blue and gray - a palette that perhaps was inspired by Cubism. The marks in Rondena largely follow the contours of the sculpture, but in some passages depart from and disrupt its volumes. This is likely the first time that Voulkos employed this tactic in a large-scale work, and it was one of his most significant contributions to the history of American sculpture. It results in an active surface, akin to the “push-pull” abstractions of Hans Hoffmann and the Abstract Expressionists, or indeed to Voulkos’s own paintings at this time, which he saw as developing hand in hand with his sculpture. Though the forms of Rondena could be compared to those of other sculptors working at this time – notably Fritz Wortruba, whose bronzes impressed Voulkos greatly – the visual dynamism that he was able to achieve with color was entirely unique. He would go on to apply the same method to masterpieces in the following year, such as the Cubist-inspired Sitting Bull (Santa Barbara Museum) and Little Big Horn (Oakland Museum). But we see it first in Rondena. Rondena was first exhibited at the Pasadena Art Museum in a one-man show held from 16 December 1958 through 25 January 1959. It was subsequently displayed at the Felix Landau Gallery in Los Angeles, in another solo exhibition entitled Sculpture/Painting/Ceramics, held in May 1959. It was at Landau that Betty Sheinbaum acquired the sculpture, alongside the painting Flying Red Through Black. This canvas relates both in its title and style to other paintings by the artist, among them Red Through Black (now in the Fine Arts Museums of San Francisco, a gift from Voulkos’s friend, the artist Manuel Neri). One of the distinguishing features of these Abstract Expressionist works is the addition of sand for texture, surely a borrowing from Voulkos’s clay practice. An interesting aside regards the title of the work, which is drawn from the vocabulary of flamenco guitar, which Voulkos played proficiently. A rondeña is a musical form (palo) within the tradition. Several other titles used by the artist in the 1950s also allude to Spanish music, including the aforementioned Rasgeado and Black Bulerias, and Tientos (1959). Voulkos’s collaborative period with Mason, and the possibility of making ceramic works at the scale of Rondena, came to an abrupt end when he lost his job at Otis in 1960. He was obliged to head north, to take up a new position at the University of California at Berkeley. Though he did shuttle back and forth to Los Angeles for a short time to complete works in progress, the move soon precipitated a shift in direction. He ceased making monumental ceramic sculptures, retraining his sights on bronze (though continuing to make arrestingly experimental clay pieces at smaller scale). Rondena is all the more significant given this trajectory. It was made in a narrow window within Voulkos’s career, one in which he was both literally and figuratively at the height of his powers. It stands as a powerful testament to his ambition and vision at this moment: the very apex of his breakthrough years.